A pressure washer will keep your house, lawn, cars and many more things clean. Many people now a day started using pressure washers because it makes the cleaning task easier and more effective. Cleaning by taking water in a bucket is much more tiresome than using the technology. 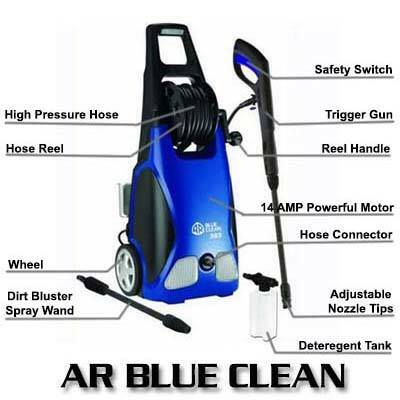 AR Blue Clean AR383 1900PSI 1.5GPM 14Amp Electric Pressure Washer is powerful, durable, reliable and very easy to use. It is the best selling power washer model of the company and has plenty of good reviews in the top e-commerce sites such as Amazon. It is a lightweight and powerful electric pressure washer in the market. Annovi Reverbari has been doing their business for more than 50 years producing different products and is known for their quality. With the tremendous passion for innovation, the company came out with AR Blue Clean Pressure washers. Among many of their pressure washer models, AR383 is considered to be their best invention. AR Blue Clean AR383 1900PSI 1.5GPM 14Amp Electric Pressure Washer is a cold water pressure washer which runs by electricity. The body is of Copper, Aluminum, and Plastics. 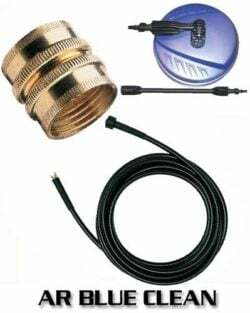 It is accommodated with the necessary kit which is seemingly compact package. The motor has 14 Amp/1.5 GMP universal motor which is strong and powerful. Its 20 foot long and strong hose helps you to take the spray gun to a certain distance to the corner of your garden. You can connect the machine from any corner of your house with the 30-foot cord which is available with the product. It has a convenient spray gun to adjust the water pressure by rotating the nozzle according to your necessity. The device’s Total Stop System (TSS) stops the machine when it is not in use to give support for the longer use and save the energy. You can also use it with or without soap/ foam bottle that attaches to the unit itself. It comes with a Turbo spray lance and the detergent tank and you can directly attach it to the spray gun for better cleaning. The design makes the product easier to move around with. This electric pressure washer is better than a standard gasoline pressure washer and it is much quieter, lighter and easy to use. The CSA Internation certifies this power washer for safety. The manufacturer company gives you 1-year warranty for this product. Powerful and Durable machine: AR Blue Clean AR383 1900PSI 1.5GPM 14Amp Electric Pressure Washer has 14 Amp/1.5 HP universal motor and tri-axial pump. It creates 1900 PSI water pressure to complete your needs. If you are not going to use it for commercial purpose, the power that you will get will be much more than your need. The product makes up to 30 times more pressure as a typical garden hose. Auto Stop: The Total Stop System (TSS) makes the engine shut off when you are not using the trigger. This system prolongs the life of the pump and saves energy to minimize the e-energy loss. Impressive Spray Gun: The spray gun has Quick-Coupler fittings for easy installation/ removal of the HP hose and lances. You can control the spray pattern varying from a wide fan to a “pencil-point” HP spray by rotating the nozzle. You can change the lance to Turbo lance to increase the effectiveness of the cleaning power up to 50%. Flexibility: The 20-foot high-pressure hose allows the spray gun to take far away from the machine. It reduces the water consumption by over 80% and gives you full support in cleaning. With the 30-foot power cord, you can connect the device to electricity from any corner of your house while the machine can rest outside. Detergent Tank: You will get a 14 oz detergent bottle for an easy detergent application. You can attach the separate detergent bottles directly to the spray gun to make your car look shiny. Warranty: With the product you are going to get 1 year of “Bumper-to-bumper” warranty. The company will provide you the facility to repair the device free of cost if there is any manufacturing defect. Besides many benefits, some users complain with the hose reel. According to their observations it is difficult to reeling the hose. Some users say that sometimes it leaks in the hose. The solution for this kind of leak is to wrap the leak area with some waterproofing tape. The device combines an affordable price with medium duty power and good quality to satisfy the home based needs. The use of electricity helps the device to make very less noise than the devices that are run by gas. The CSA International certifies the device for its safety. The price of the product is much less than other similar products so that you can afford it easily. If you really want to keep your house, car, garden, road in front of your house and many more things that AR Blue Clean AR383 1900PSI 1.5GPM 14Amp Electric Pressure Washer can be one of your best options. Click To Buy it now on Amazon with Lowest Price & FREE Shipment!